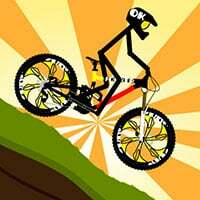 Stickman Bike Rider is a cycling game. What surprises your favorite stickman will bring to you this time? Ride, jump, flip and crash through 30 worlds of bike racing fun! Prepare for the race of your life in this highly addictive stunt bike physics game. Use the keyboard to operate the stickman’s movement, avoid all obstacles. Maintaining the balance of the stickman, otherwise, he may lose control. There are lots of maps you can experience if you pass in Stickman Bike Rider Game. Enjoy and have fun in playing this free online game. Good luck. Also make sure to check out Super Stickman Biker Game, you may enjoy playing it.